Organ study at MLC prepares students to serve as organists in Wisconsin Evangelical Lutheran Synod churches. Students study the playing of hymns, Psalms, liturgies, choral accompaniments, and service literature appropriate to liturgical Lutheran worship. The number of students enrolled in organ courses at MLC is very likely the highest of any school in the United States that offers organ lessons. Enrollment has been stable at about 100 students per semester for many years. Students range in ability from beginners to advanced players. Opportunities exist to perform publicly in studio recitals, campus chapel services, concerts, and congregational settings. Approximately 50 students play for chapel services during a semester, with some doing so several times. The organ facilities at MLC are extensive. Currently 17 pipe organs are available on campus, representing one Canadian and seven American builders. These organs range from smaller practice instruments to two contrasting 3-manual instruments in performance spaces. 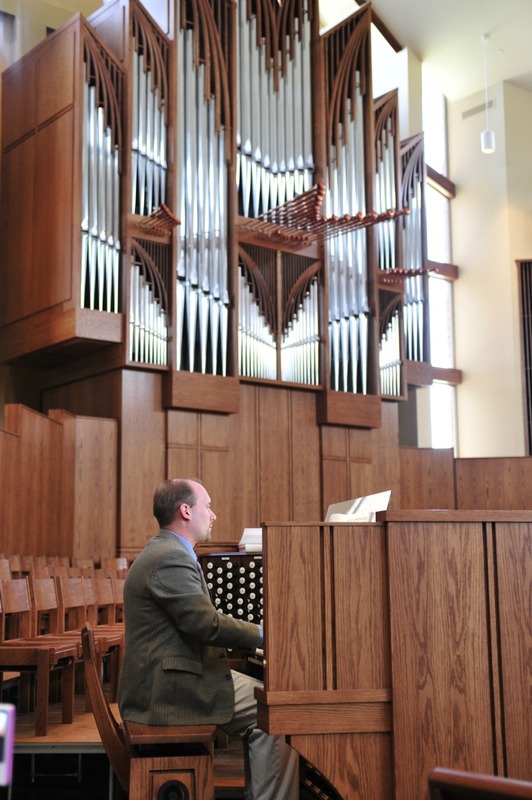 The largest organ on campus is a 57-rank pipe organ built by the Schantz Organ Company. Designed specifically for Chapel of the Christ, it was installed in 2010. Although informed by European organ design of various periods and locations, the organ is influenced especially by American organ building of the late 19th century to the present. The second largest organ on campus is the Backer Memorial Organ located in the Wittenburg Collegiate Center Auditorium. This 42-rank pipe organ, built by the Casavant Organ Company, is designed in the neo-Baroque style. 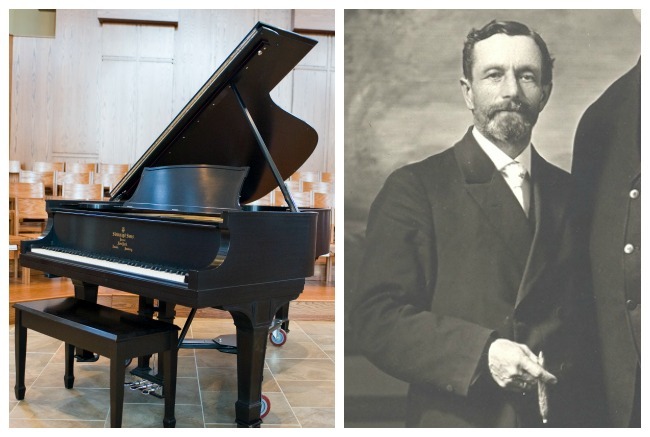 The Reuter Steinway, the 6-foot, 11-inch grand piano in the choir area, is named for Fritz Reuter, Dr. Martin Luther College’s first music professor (pictured). When Reuter arrived in 1908, the campus consisted of one building, now called Old Main. Reuter quickly saw the need for a music facility, and within three years the synod authorized the building of an Aula, the present Music Hall. Reuter also saw the need for a first-class grand piano, which he eventually purchased for $850, the money contributed by congregations where Reuter’s male chorus had sung. In 1929, the Reuter Steinway was moved from the Aula to the large auditorium-gymnasium in the Recitation Building, now Wittenberg Collegiate Center, where it served for recitals and choir accompaniment. By the early 1940’s, the instrument was showing wear, both from considerable use and from the heat damage it had sustained while in the Aula, where it had stood on the stage directly above the boiler plant. In 1944 Professor Emil D. Backer, Reuter’s successor, sent the instrument to the Steinway factory in New York for repair and rebuilding, a project funded by the music department. The Reuter Steinway returned to the campus in 1946 as a virtually new instrument and continued to serve as before. It moved to a Music Center studio in 2004. With the building of the Chapel of the Christ, Dr. John Nolte, the music division chair, sent the instrument to Kenneth Hannah of Stillwater, Minnesota, to be renovated again. The music division covered the $20,500 cost of the project. By common consent the piano is considered a virtually new instrument, and it now resides in the Chapel of the Christ. Here it will be used to glorify the Lord God Almighty; the Holy Spirit, Source of our gift of music; and the Lord Jesus Christ, whose name the chapel bears.